Variety: Moraiolo (80%), Leccino and Frantoio..
“Messer Francesco 1640” is the premierebrand of the Malvetani company. The olivesgathering begins during the first half of October, when the fruits are mostly green. The olives, after passing through a de-leafing and de-branching process, are washed in running water and dried before being crushed. The extraction takes place in controlled atmosphere without the addition of water, at very low temperature, well below the 27 degrees centigrade that the law provides as the maximum limit for "cold" extraction.This allows us to maintain as much as possible the precious characteristics of freshly harvested olives. The result is an excellent and exclusive product of remarkable quality, equilibrium and elegance, with the preservation of all the<g> aromas> and antioxidant principles that with heat and with the addition of water would have been lost. 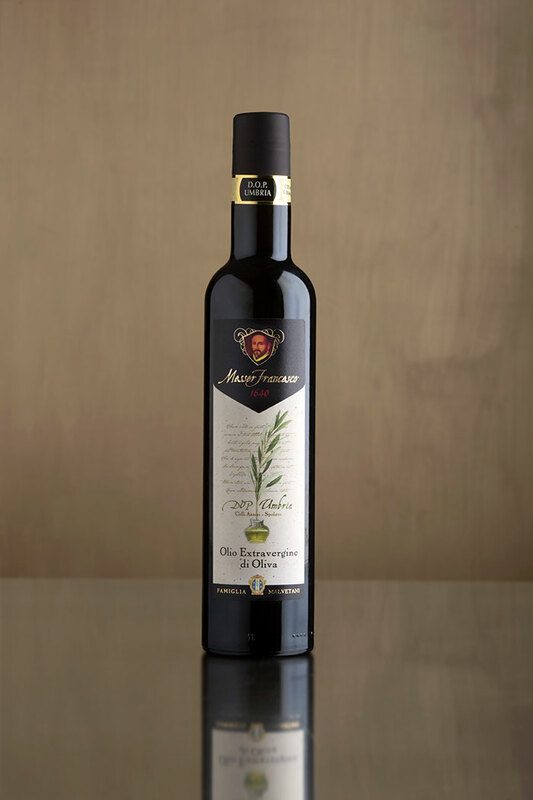 The EVOO obtained is a rare and precious product, resulted from five centuries of tradition and passion. Intense green color with yellow reflections, clear due to filtration that makes the oil more stable, high fluidity due to the high presence of monounsaturated fatty acids. You perceive odors of green fruit. Medium-intense aroma with notes that recall artichoke and green almond. The taste confirms the olfactory sensations of artichoke and green almond, with green leaf associated with medium-intensity bitter nuances and spicy notes that denote a good polyphenol contents. Balanced and harmonic.